Noise Boards | As she rides the Beast. 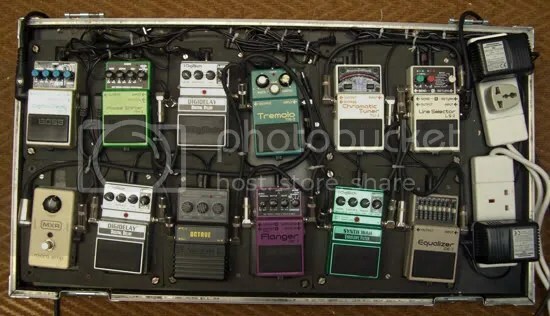 Boss DD-3 Digital Delay, Boss PH-3 Phase Shifter, Digitech X-Series Digidelay, Boss TR-2 Tremelo, Boss TU-2 Chromatic Tuner, Boss LS-2 Line Selector. MXR Micro Amp, Digitech X-Series Digidelay, Arion MOC-1 Octave, Boss BF-3 Flanger, Digitech X-Series Synth Wah, Boss GE-7 Equalizer. 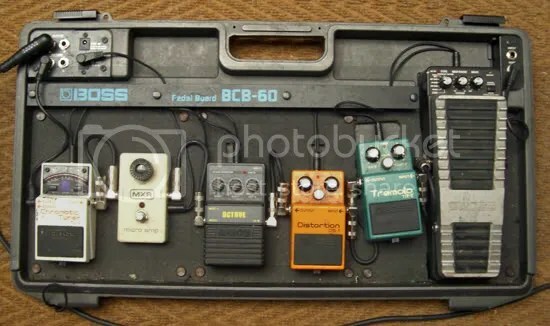 Boss TU-2 Chromatic Tuner, MXR Micro Amp, Arion MOC-1 Octave, Boss DS-1 Distortion, Boss TR-2 Tremelo, Boss PW-10 V-Wah. That’s where it’s at, with lots more to come!